2018 is going to be an amazing year to be a member of The House of the Seven Gables! We’ll be celebrating the 350th anniversary of the famed mansion with events inspired by the architectural and literary history of the National Historic Landmark District site. Want to be a part of it all AND support our dual mission of education and preservation? Join us today! 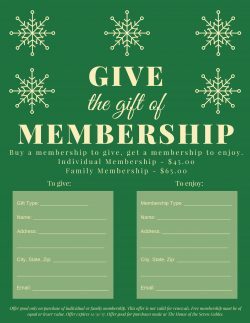 From now until December 31, all new members will get a membership to give as a gift this holiday season. It’s a great way to bring along a friend to a lecture or a neighboring family to our school vacation programs. Just print this form and mail it in with payment OR stop by our site any day from 10:00 a.m. – 5:00 p.m. to drop it off. Stay tuned for a number of member-exclusive events including a private tour of Historic New England’s Gedney House and a lawn party for Salem Celebrates the Fourth. Support local history at The House of the Seven Gables today!